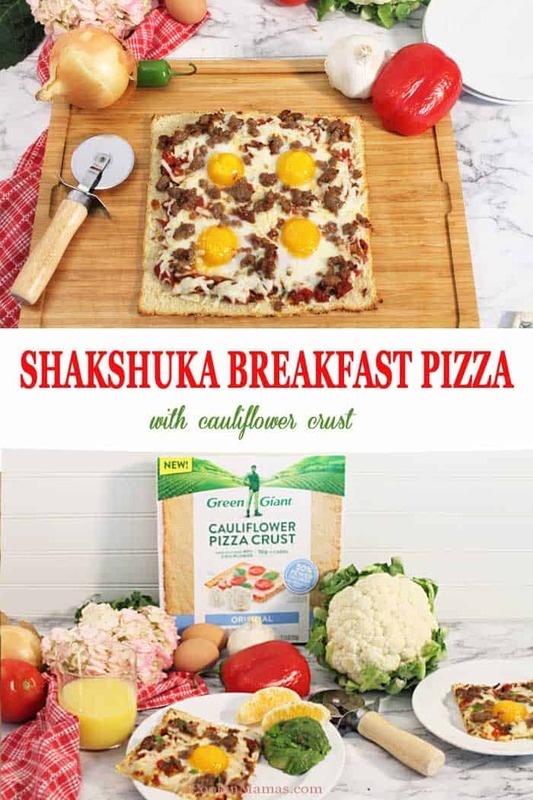 Now you can have pizza for breakfast! 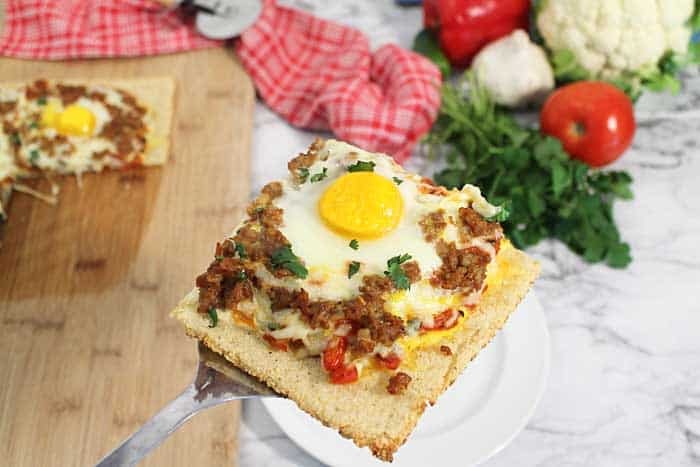 This delicious low-carb Shakshuka Breakfast Pizza starts with a cauliflower crust and is topped with a spiced tomato and veggie sauce, sprinkled with sausage and cheese then topped with eggs. The perfect start to any day in about 30 minutes. 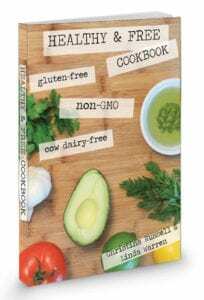 Option for vegetarian diet when a meat alternative is used. I received compensation for this post from Green Giant but all opinions expressed are strictly my own. 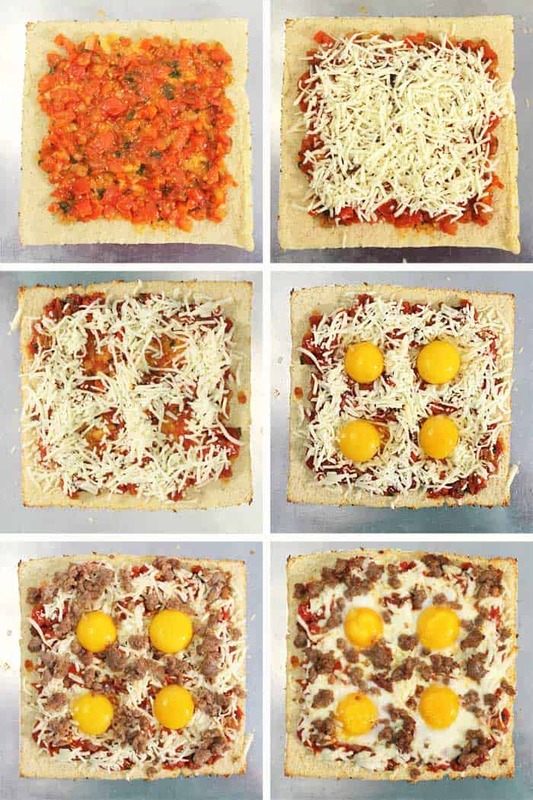 Pizza for breakfast? Sure thing! Preheat oven to 425 degrees. Carefully set pizza crust on cookie sheet or pizza stone and cook for 18 minutes. While pizza crust in baking, prepare the sauce. Sauté onion, red pepper and garlic in 1 tablespoon olive oil for 5 minutes. 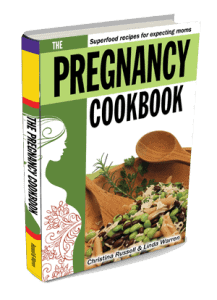 Add cilantro, spices and minced jalapeno to the vegetables and stir. 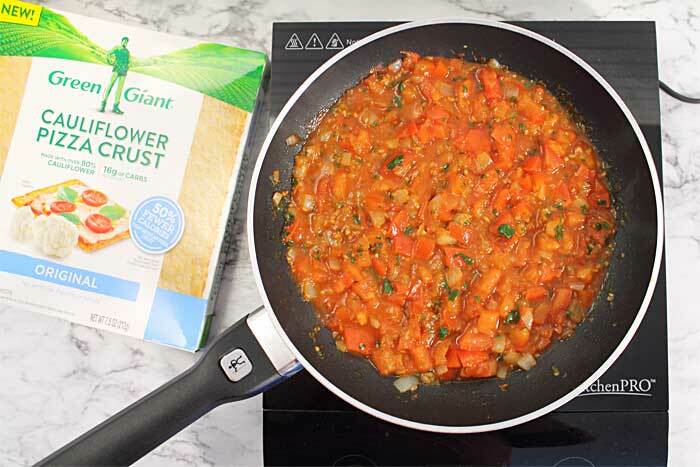 Combine chopped tomatoes or ½ cup diced tomatoes from can, tomato sauce and a little sugar and add to vegetables. Simmer for 10 minutes, stirring occasionally. While sauce is simmering, cook up 4-oz of breakfast sausage, mild Italian sauce, 4 strips of bacon or meat alternative. Slice into 4 pieces being careful not to disturb eggs. 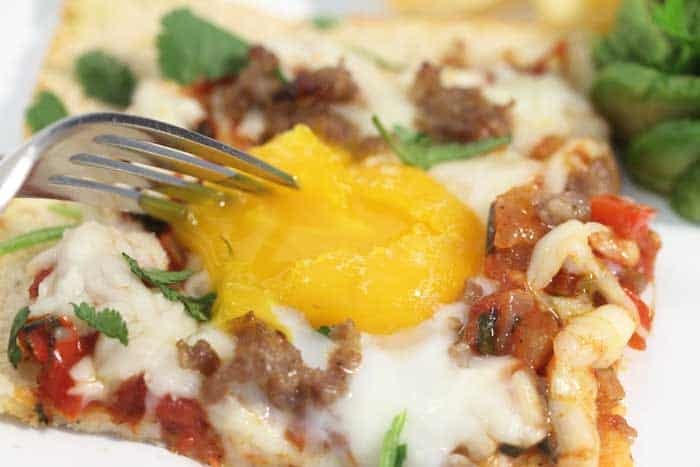 Hot pizza may be garnished with parsley or cilantro. Serve immediately. 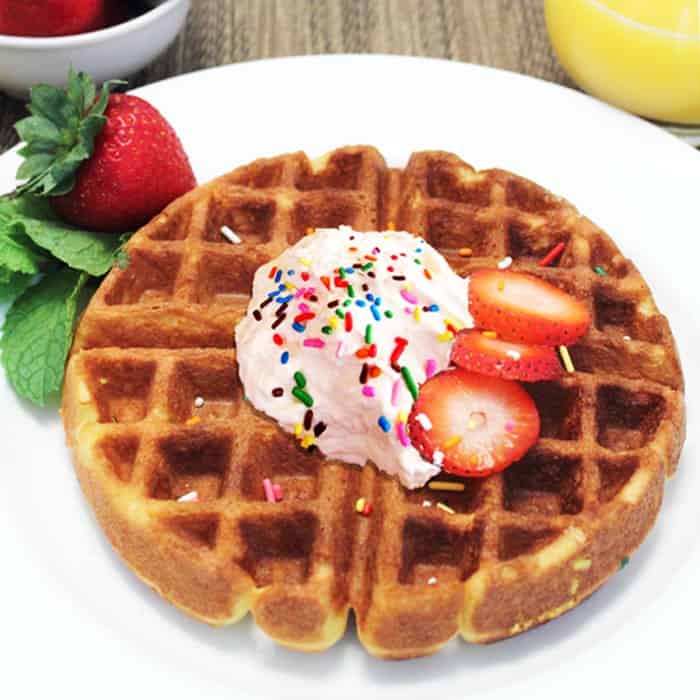 Doesn’t this look like the best breakfast ever? 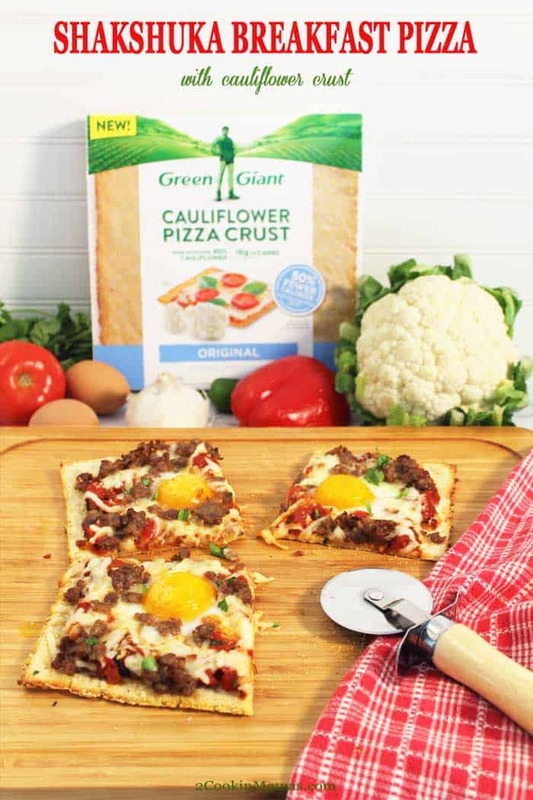 Want to give their Cauliflower Pizza Crust a try? 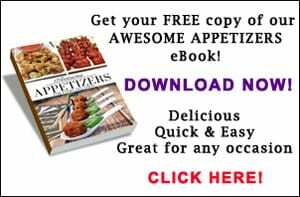 Checkout this coupon for some great savings. Now you can have pizza for breakfast! 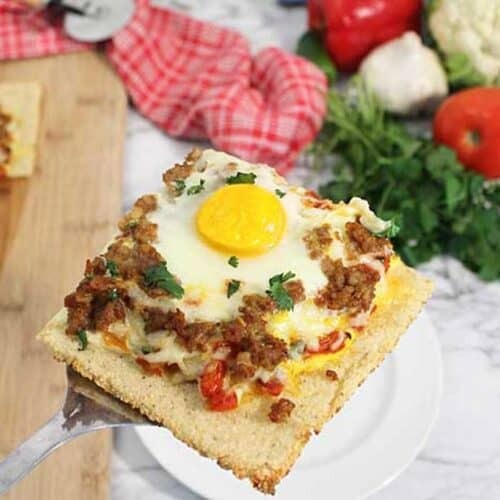 This delicious low-carb Shakshuka Breakfast Pizza starts with a cauliflower crust and is topped with a spiced tomato and veggie sauce, sprinkled with sausage and cheese then topped with eggs. The perfect start to any day in about 30 minutes. Don’t want to bother making the shakshuka sauce. 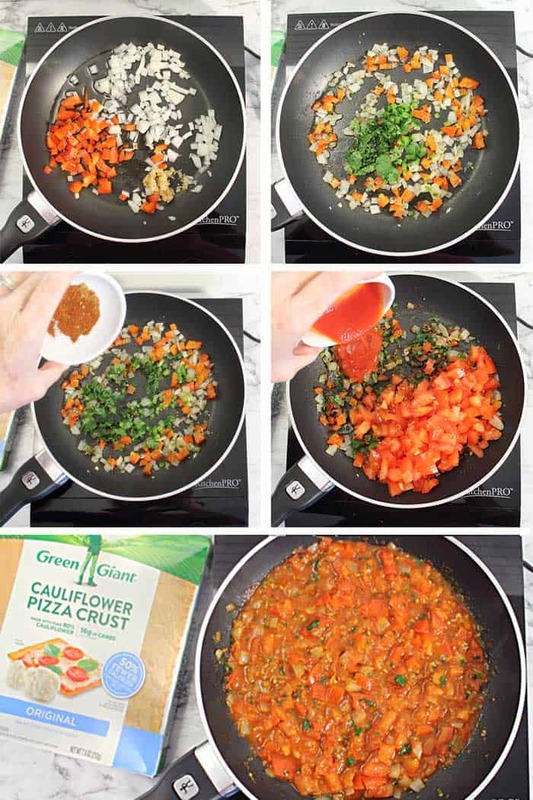 You can use your favorite marinara or roasted pepper sauce if you prefer. 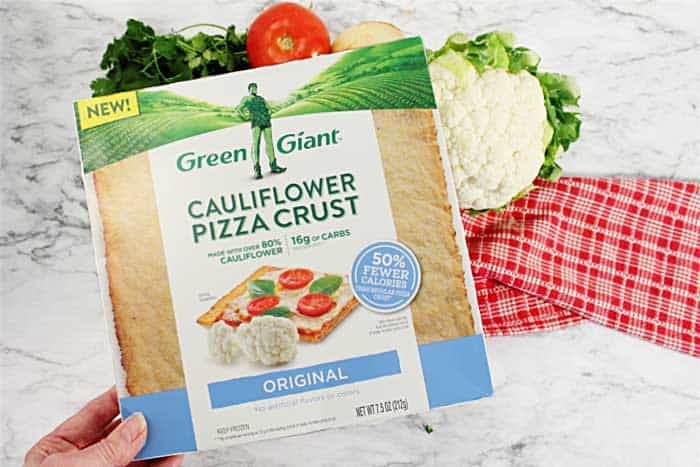 Try this cauliflower crust as a great swap out for regular crust when making my Pepperoni Pizza, Three Pepper Pizza or Thai Chicken Pizza! 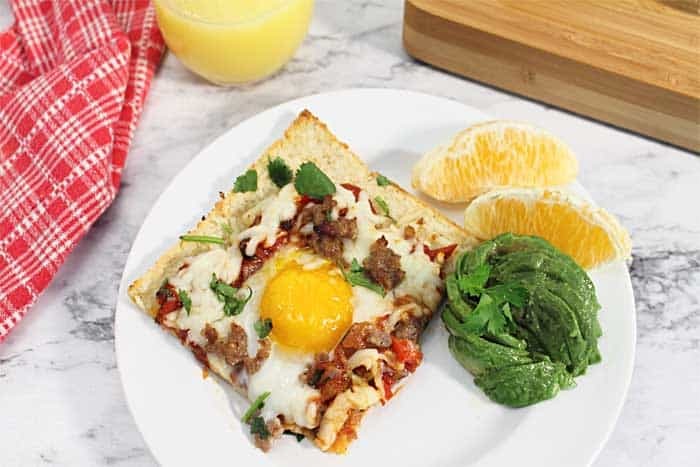 And mama thought we’d never have pizza for breakfast. lol It really is super delicious and feels like breakfast with the egg on top. 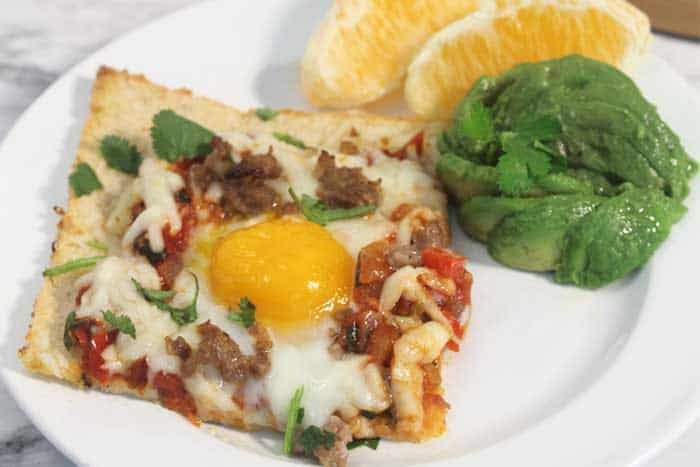 Having pizza for breakfast was a first for the family and we loved it! What a brilliant idea! 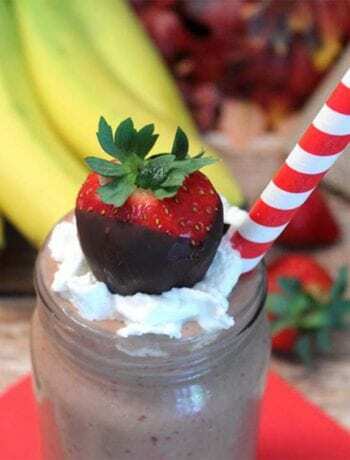 My family would absolutely love this, I can’t wait to make it soon! I am SOOO excited about that pizza crust! I can’t wait for it to start popping up in my local grocery stores! 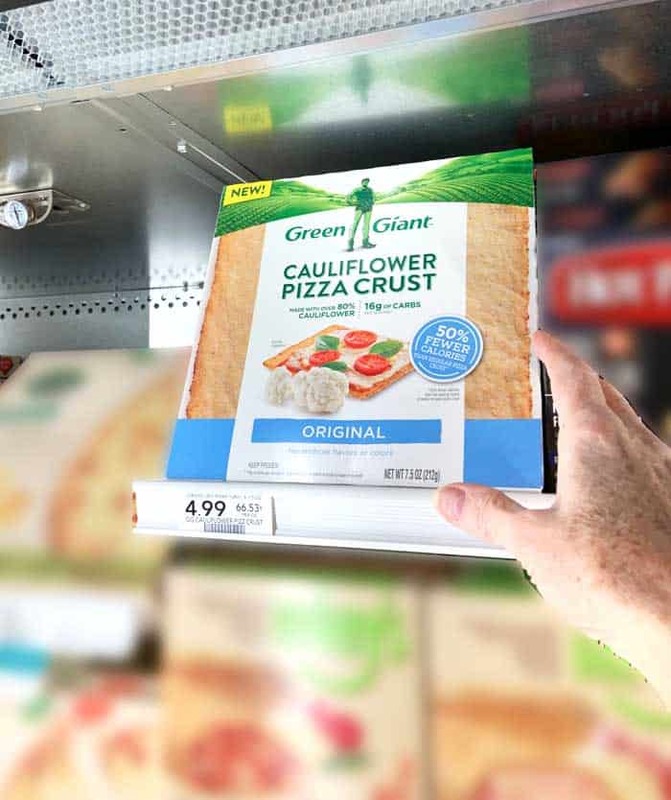 It’s great to have a gluten-free/ low carb alternative to a regular crust. Hope they get it in your area soon. 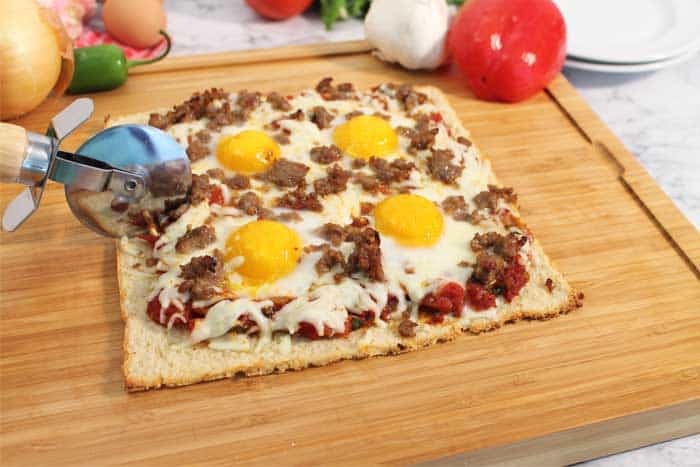 There is not a single ingredient in this delicious breakfast pizza that I don’t like! Everything is so balanced and flavorful! 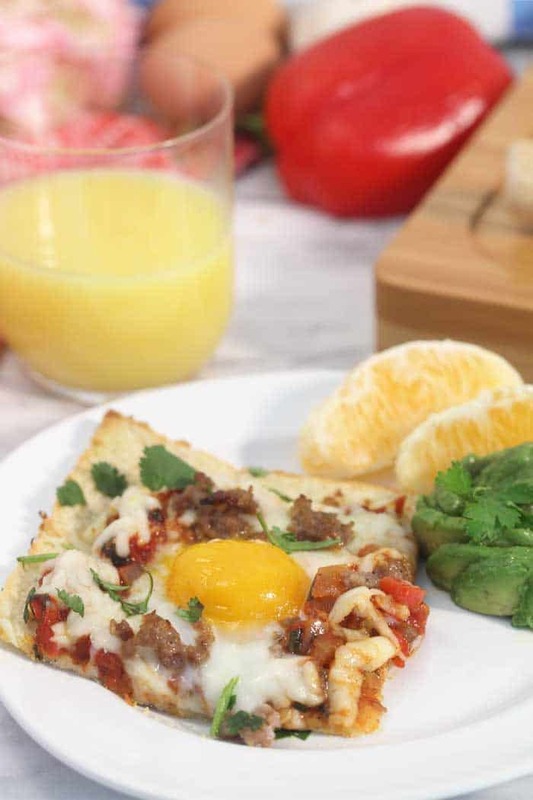 It does have everything you could wish for for breakfast with tons of flavor and healthy ingredients. 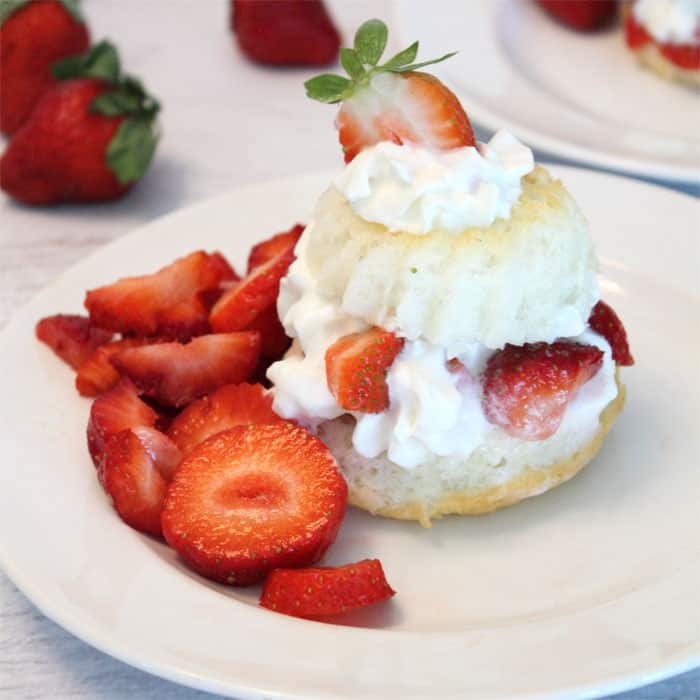 Makes a great Sunday brunch.